Some 43 large forest landowners received accolades today from state officials for upgrading forest roads and stream crossings to improve salmon habitat and water quality. 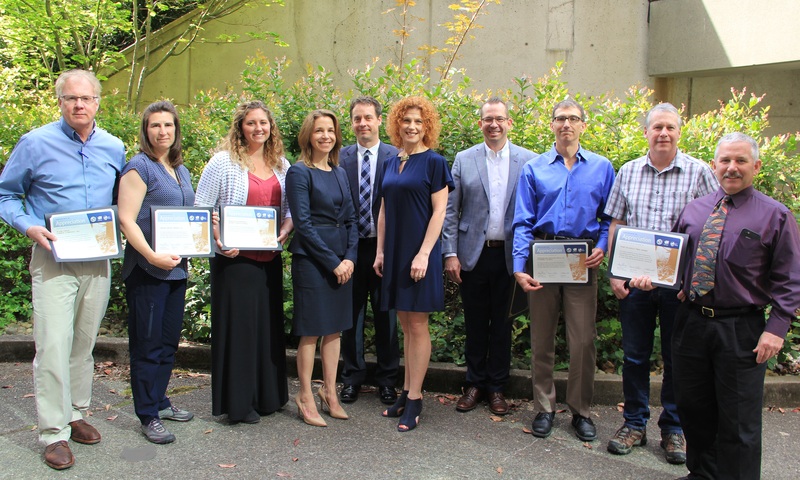 Commissioner of Public Lands Hilary Franz (fourth from left) and officials from the departments of Ecology, and Fish and Wildlife presented certificates of appreciation to several large landowners for taking steps to improve fish habitat in forest streams. At a regular quarterly meeting of the state Forest Practices Board today, officials from the departments of Natural Resources, Ecology and Fish and Wildlife praised the 43 large forest landowners that had completed the Board’s required road maintenance and abandonment plan process. Meanwhile, more than 50 additional large forest landowners continue to develop road inventories and make required improvements by the Board’s 2021 deadline. These efforts come in response to state rules that require landowners to build and maintain roads in a way that minimizes damage to public resources, such as clean water and healthy habitat for native fish. Roads are considered a major contributor to runoff that can degrade water quality in forest streams. Undersized or improperly placed culverts where roads cross streams can block salmon and other fish from reaching upstream areas vital to their survival. Wildfire Awareness Month; are you ember aware?